Eat Drink Walk gourmet food tours in Lisbon, as the name suggests, are the type of foodie experiences you’ll be talking about long after Portugal has released you from her divine grasp. Run by born-and-bred Alfacinhas (Lisboners), there are various tours to choose from including a downtown Lisbon tapas tour where you can sample roasted suckling pig or, a sophisticated foodie tour of Chiado – one of the most cosmopolitan neighbourhoods of Lisbon — where you will quaff wine. You’ll spend around four or five hours wandering the city streets, sampling local Portuguese specialties and drinks – what more could you want? The name of this local dish is certainly a mouthful and eating one will likely leave you in a food coma for hours. Picture this: a towering mountain of bread layered with pork, smoked sausage and bacon, drenched in thick, gooey melted cheese and smothered in a rich spicy sauce with a fried egg on top. 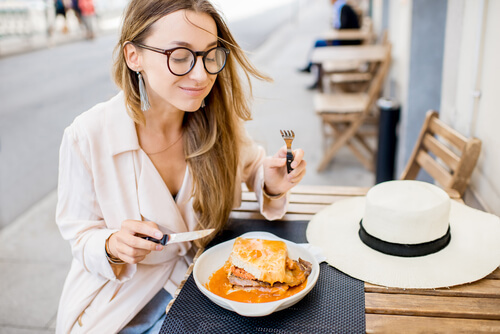 The Francesinha (Little Frenchie) is the Portuguese version of a croque-madame. While it’s not something you could eat everyday – you’ll be struggling to finish even one – sampling this very popular dish is a must when in Porto. Some places offer two-for-one deals, too. Portugal may be small in terms of land size but in the food stakes, it punches far above its weight. If luxe, high-end dining is your thing, you’ll be pleased to know that there are several Michelin-starred restaurants throughout this gastronomic region. Alma was awarded a second star for 2019, making it the second restaurant in Lisbon to hold two stars. Other key venues to check out include the Yeatman in Porto (from executive chef Ricardo Costa), Ocean (from Hans Neuner) and Vila Joya (from Australian-born chef Dieter Koschina). The latter two are located in the Algarve. A short detour from the coastline takes you inland to Caldas da Rainha – a charming, lesser-visited town in western central Portugal. The town’s lively and vibrant fruit market in Republic Square is open every day from 7am to 1pm and is a spirited place to lose yourself while snapping pictures of brightly coloured umbrellas, fresh local produce and cheery locals. 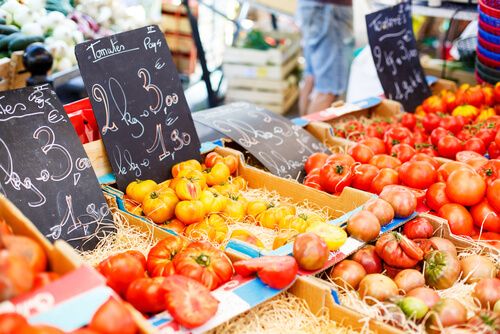 Other farmers’ markets worth visiting include Mercado da Ribeira in Lisbon for fresh seafood and the Bolhão Market in Porto for cheese and fresh bread. From clams and oysters to mussels, lobster, squid, Atlantic fish and Portugal’s ever-famous salt cod dish, Bacalhau, the country does seafood pretty damn well. There’s no better setting for your fish feast than Rei das Praias in the Algarve. The restaurant features an unparalleled beachside location with a wooden deck that juts out over the sand so you can dine with the Atlantic Ocean as your backdrop. Other hotspots include Ostras e Coisas in Porto (try the oysters) and the unassuming Salta o Muro, also in Porto (try the deep-fried sardines). 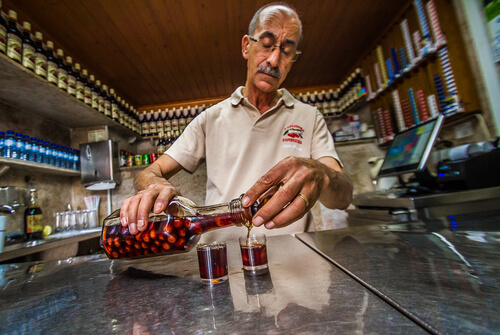 Ginja is a sweet cherry-flavoured liqueur that was first used for digestive purposes before becoming one of the country’s most popular drinks. You’ll find ginja bars all over the country, many of which are open daily, but some of the best are found in Lisbon and Obidos. LicObidos is one of the biggest manufacturers of the specialty drink and, by special request, you can arrange a tour of its 25,000 ginja tree plantation. Obidos, with its age-old architecture, relaxing vibe, fortified old town feel, beautiful squares and narrow streets, is well worth a visit for a couple of nights. Stay at the breathtaking Pousada Obidos, a luxury hotel located in a 12th-century medieval castle. The castle is one of seven marvels of Portugal and the hotel’s restaurant serves up delicious regional and international cuisine. The service is great and the roast guinea fowl is delicious. The pastel de nata is a traditional dessert that continues to remain a huge part of Portuguese culture. Made using layers of puff pastry, dollops of creamy custard and dusted with cinnamon, these simple yet oh-so-delicious tarts are the talk of the town. 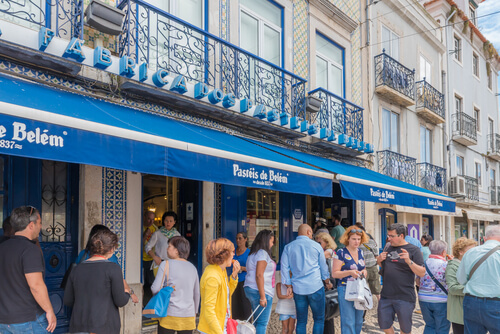 They are especially popular in Lisbon where the very first pastel de nata was made in 1837 at Pasteis de Belem, a bakery 10km outside of the city. The bakery is an institution and continues to make its tarts using an ancient recipe – how cool. It’s well worth the visit, despite the queues and once you wrap your lips around a tart, you’ll forget you ever lined up. For a wine experience off the beaten track, take yourself over to Pico Island – the second-largest island of the Portuguese Azores archipelago with the country’s highest mountain peak. Here, you can sample rare tipples on the volcanic island and go hiking amid its rocky landscape. A wine tour with Tripix Azores is a great way to get a solid understanding of the island’s unique wine culture and sample some of the region’s best.